There are two food-related items that are important to me when I’m traveling with my children. One is that they always have some exposure to local traditions and food. The other is that they get some experience eating at restaurants that do not have a children’s menu and where they cannot color on the tablecloth. That is to say, I like us to have at least one reasonably fancy meal out. We accomplished this with Tommy in Paris at Le Train Bleu. 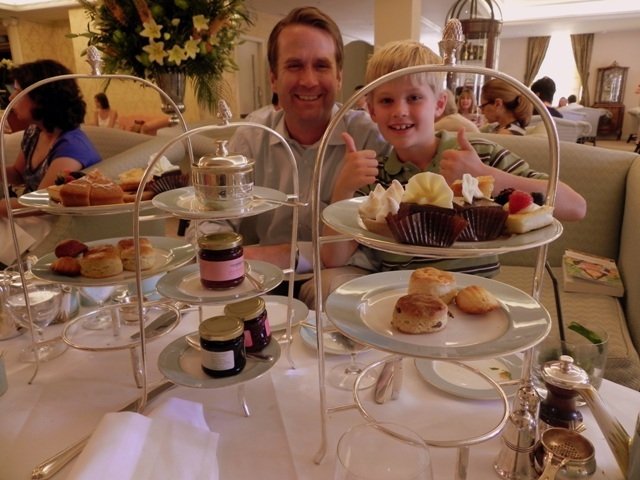 Eating in London I decided that our best bet for an authentic and upscale dining experience was afternoon tea. And although I scouted some different locations where we could do so, in my mind I never strayed too far from Fortnum & Mason, arguably the most traditional place in London to have this most British of meals. Fortnum & Mason is an elegant and old-fashioned department store near Piccadilly Circus that is justifiably famous for its food halls where you can purchase everything from live crabs to candy potted shrimp. The store actually houses five different restaurants. You can have tea at any of them, but the truly formal tea is served at St. James’s on the fourth floor. The atmosphere starts as you ride the small, creaky, paneled and mirrored elevator, which opens right into the dining room. They’ve redecorated since the last time I was there in 2003. It’s still in shades of peach and gold, but one relaxing change is the introduction of sofas to sit on as you dine – a very nice addition if you’ve spent the entire day on your feet as we had at the Tower of London and then Saint Paul’s Cathedral. 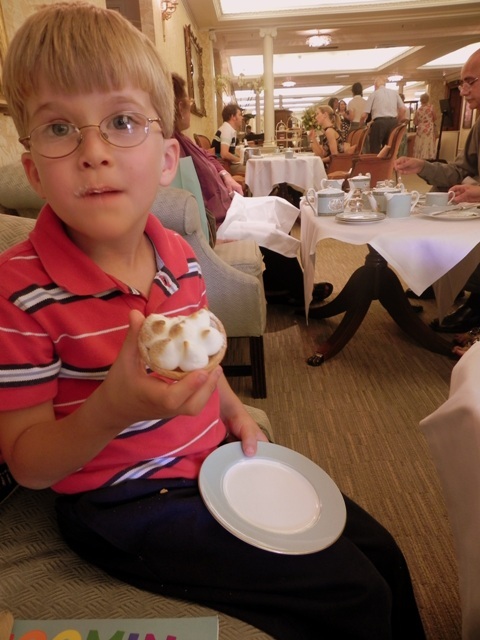 Travel-with-kids tip: Although the dining room is lovely and the food is fancy, the atmosphere at the St. James’s is decidedly relaxed. Everyone who worked there was friendly and clearly used to children. And don’t worry too much about dressing up (unless, of course, you want to!). Do avoid shorts and t-shirts; boys should wear closed-toed shoes. 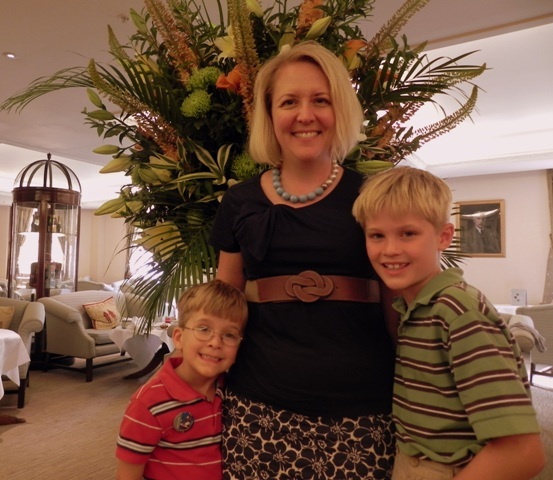 My boys wore polo shirts and chinos and were appropriately clad. There are actually three different menus for tea. 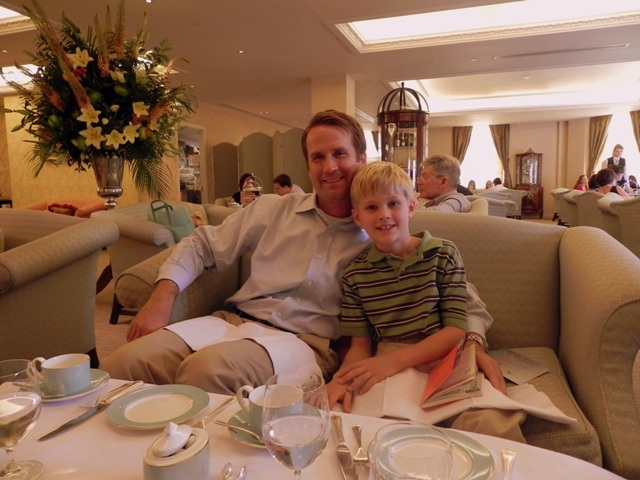 Under the friendly and expert guidance of the staff, we chose to order three Fortnum’s High Teas along with a jug of fresh lemonade for the boys. This was more than enough food for two adults and two children, even relatively big eaters like us. In fact, we were asked for and were given seconds on scones and I think our pastries may have also been replenished without our asking. We started with Welsh rarebit, Eggs Benedict (not called that in England, but that’s what it is), and a warm crab and saffron tart (no photos of this part of the meal – I apparently was too busy eating). 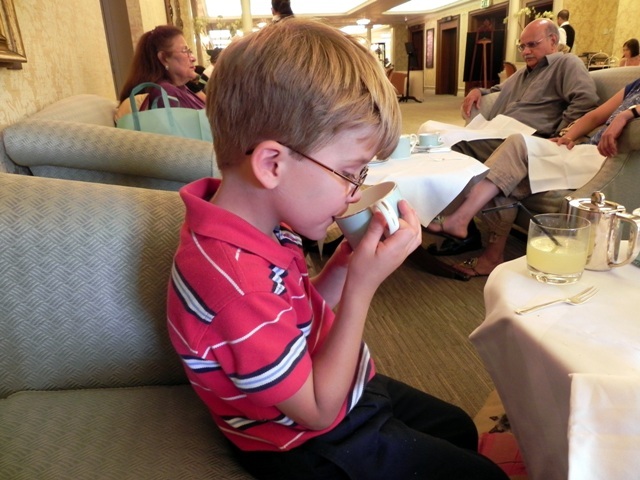 Teddy decided at this point that he wanted to try some tea, so we let him have a sip from the lovely robin’s-egg-blue china. His verdict? “Um, kinda good…and kinda not.” I don’t think we won a convert, but this was soon forgotten since our first course was followed by scones with jam and clotted cream as well as a large selection of cakes and cookies, all served in lovely tiers. There were berries and cheesecake and chocolate and lemon drizzle cake and Madeleines. My particular favorite was the lemon meringue tart. Teddy liked it too. 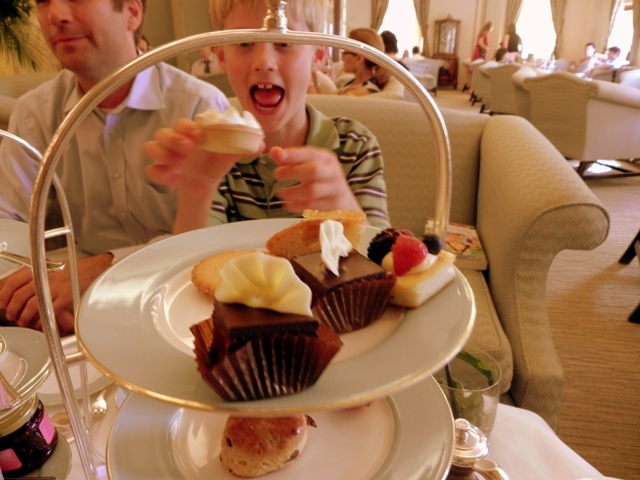 Travel-with-kids tip: Tea is an afternoon meal, but the hours are really flexible, making it ideal for children. At the St. James you can have high tea at any point from noon until 6:30, Monday to Saturday, Sunday from noon to 4:30. We chose to have tea instead of dinner, but you could easily have it instead of lunch. It’s a good idea to make a reservation – you can do so online. Tea at St. James’s restaurant is not cheap – we spent about 110 pounds or 170 dollars for the four of us. But I felt it was worth budgeting for this kind of extravagance, since it was our only expensive meal of the entire trip. And we weren’t paying just for the food, really, but for the entire experience of relaxing in that lovely room, putting on our nicest manners, and of course, eating dessert for dinner. Which, as far as Tommy and Teddy were concerned, was just brilliant. Teddy looks positively British sipping his tea! 🙂 What a great family outing. What a lovely outing for your family. I loved how the boys were dressed and they look like they are having fun. Jolly good. That’s a very good goal. I might have to try that on our next trip. Most of the time, we just ended up with cheap eat. But I think one meal for a fancy dinner or lunch is a great experience for the whole family. And look at all those lovely pastries! These pictures are ridiculously cute! Looks like you had a wonderful time. Now, listen, Missy – tea at F&M, waxing on about Wagamama!? Next time we travel together, because those are totally favorites for me, too! I am so glad I came across this post and would love to follow your blog more. 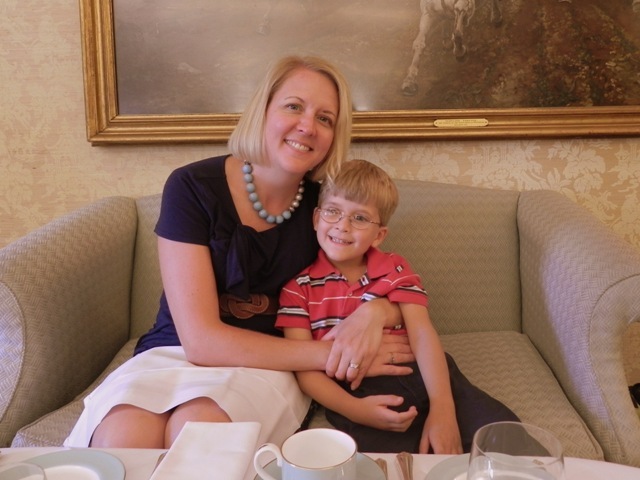 We love introducing our kids to international cuisine and cultural customs. We are going to be in London in May and I have been looking for the perfect place for tea. This looks wonderful! The Ritz, Harrods and the Orangery at Kensington Palace have also been suggested to me by a local friend. Thoughts? Thanks so much for stopping by and have a wonderful trip. 10 hours ago by motherofalltrips Window, Mystic.